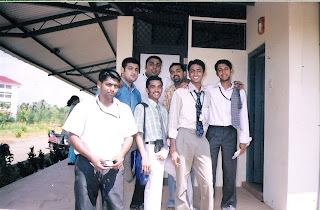 My best budds who made my two years in college an unforgettable event in my life. I am just starting college life, I cannot have to many friends cause I don't have time for them! I come home wayyyyyyyyyyy to much!! But I will have a gang of my own...called the Nehyaetts!!! hahaha! You think I will have a lot of Members? LOL!! bro wat happend to ur hand those days..??? So you dropped into my space and yeah that ABOUT ME statement is just ME ! LOL - Kept the hand inside the car door (???) u mean no other better place to keep n slam it ! I hear so many people lamenting about their good old college/school days. I really cherish my time now. dei where is Siva ?